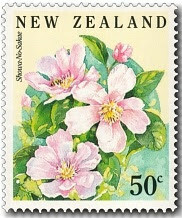 It is little wonder that camellias are amongst the most popular plants to be found in New Zealand gardens. Superb, long-lasting flowers in a profusion of form and colour, from white through to red and every imaginable shade and combination between, are borne on an easily grown, shrub-like evergreen with thick glossy leaves. In addition, camellias bloom over a lengthy period in autumn and winter when other flowers are scarce. Some hybrids even flower into summer. Flowers of Camellia japonica, the species from which most of today's ornamental hybrids are descended, arrived in England and Europe from the Orient in the 19th century. 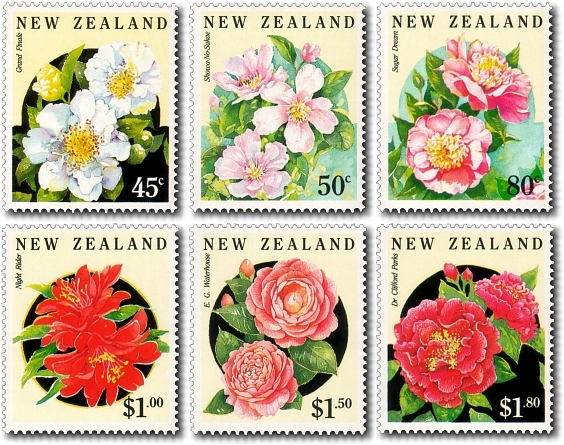 As many as 2,000 varieties have been bred from the first Camellia japonica plants. The popularity of the camellia surged again early in the century with the development of hybrids from Camellia sasanqua and Camellia reticulata. The camellia is a plant of China, Japan, Indo-China, Burma and the Indian province of Assam with up to 100 species in the genus. Camellia sinensis has insignificant flowers but its leaves are of immense importance because this is the plant we know as tea. The seeds of several species yield oil for use in textile and soap manufacture and, when suitably refined, in cooking. Camellias have held an important place in Japanese culture for centuries as elements in garden design, flower arrangement and in the tea ceremony. They feature widely in Japanese paintings and ceramic art and as the subject of many myths and legends. 45c - Grand Finale Camellia. This exquisite member of the japonica family blooms mid-season and features a very large, semi-double white flower with irregular fan-shaped petals fluted at the edges and an attractive spread of crimped golden stamens radiating from the centre. The variety was raised in the United States where it was first registered in 1957. 50c - Showa No Sakae Camellia. An early blooming camellia distinctive for its bright pink colour. This Japanese species is very similar to the sasanquas. 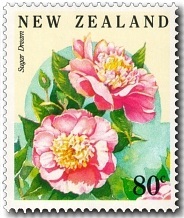 80c - Sugar Dream Camellia. An early flowering hybrid, from Camellia reticulata Dream Girl x Camellia oleifera jaune, bred by New Zealand grower, O Blumhardt of Whangarei in 1984. This soft bloom is medium in size and features a cream centre surrounded by pink petals. The plant has open upright growth. $1.00 - Night Rider Camellia. This unusual hybrid, from Ruby Bells x Camellia japonica Kuro Tsubaki, is also the product of O Blumhardt of Whangarei in 1985 and features a distinctive black-red semi-double bloom. Its foliage is also distinctive, being a dark reddish colour. The plant has medium upright growth. 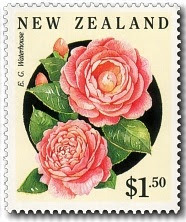 $1.50 - E G Waterhouse Camellia. A medium size formal double in light pink, this Australian species is a spectacular example of a camellia hybrid from Camellia saluenensis x Camellia japonica, registered in 1954. The plant has vigorous upright growth. 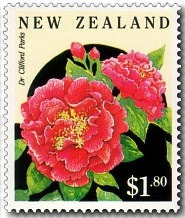 $1.80 - Dr Clifford Parks Camellia. This hybrid from Camellia reticulata Crimson Robe x Camellia japonica Kramer's Supreme, from the United States of America, features an extremely large and variable semi-double to peony or anemone form. 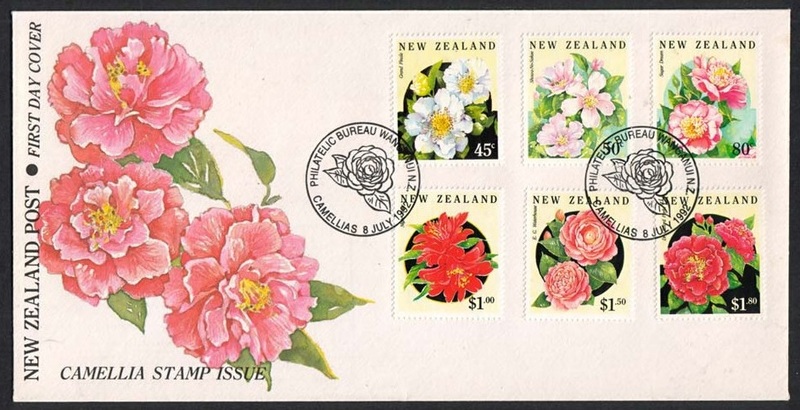 A vigorous grower, it has a red flower with an orange cast, registered in 1971. 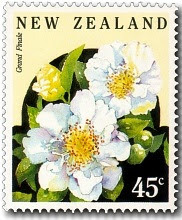 First Day Cover - 8 July 1992. 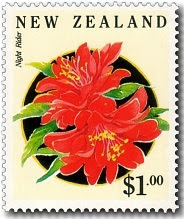 These stamps remained on sale until 8 July 1993.